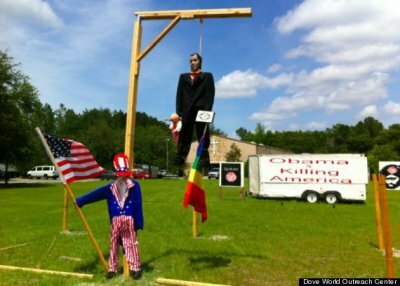 GAINESVILLE, Fla., June 8 (UPI) — A Gainesville, Fla., pastor said the Secret Service has contacted his church about a display depicting President Barack Obama hanging by a noose from a gallows. The Rev. Terry Jones — who gained celebrity in recent years by threatening to burn Korans publicly — told New Times Broward-Palm Beach no racial symbolism was meant by the display at the Dove World Outreach Center, but he conceded the Secret Service was “justified” in contacting the center about it. Jones said he didn’t think the headline and the effigy would give encouragement to anyone who wished harm on the president. “He is not black; he is not white; he is the president of the United States,” he said.